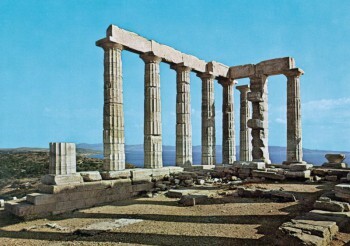 Cape Sounion (Modern Greek: Aκρωτήριο Σούνιο, transliterated Akrotírio Soúnio, pronounced [akroˈtirʝo ˈsuɲo]; Ancient Greek: Ἄκρον Σούνιον, Άkron Soúnion; Venetian: Capo Colonne, “Cape of Columns”) is a promontory located 69 kilometres (43 mi) south-southeast of Athens, at the southernmost tip of the Attica peninsula in Greece. 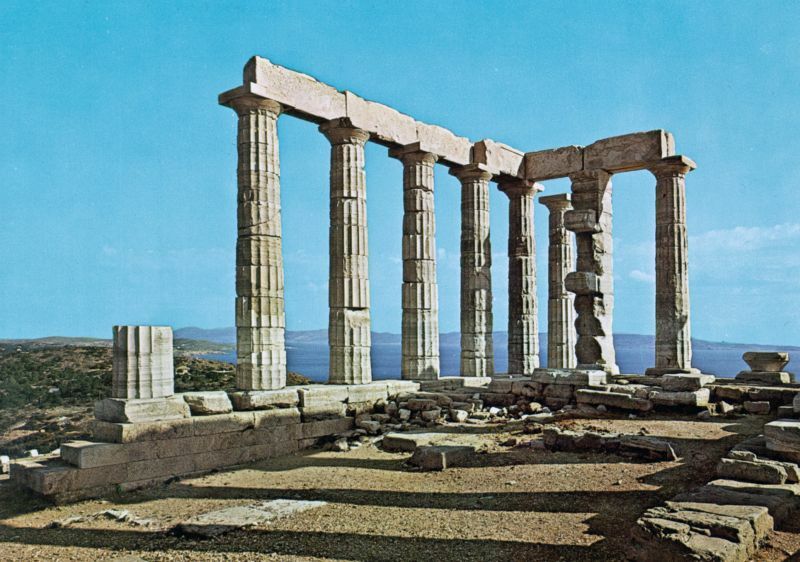 Cape Sounion is noted as the site of ruins of an ancient Greek temple of Poseidon, the god of the sea in classical mythology. The remains are perched on the headland, surrounded on three sides by the sea. The ruins bear the deeply engraved name of English Romantic poet Lord Byron (1788–1823). 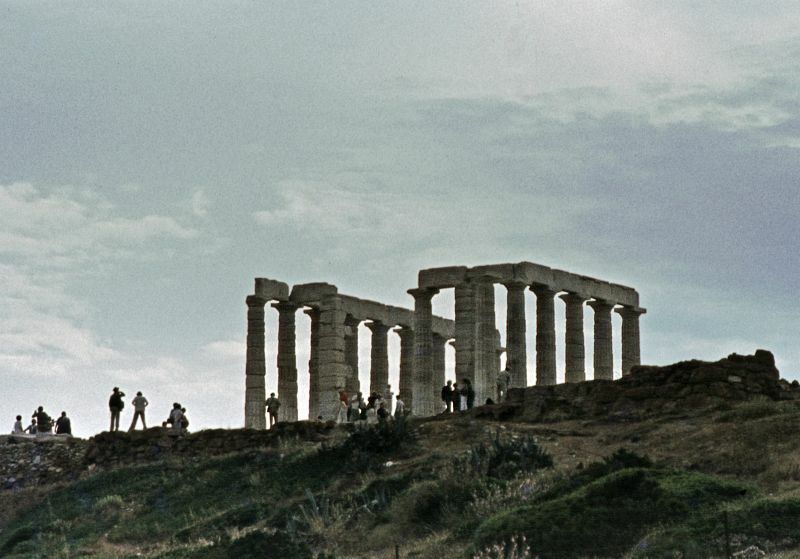 According to Greek Mythology, Cape Sounion is the spot where Aegeus, king of Athens, leapt to his death off the cliff, thus giving his name to the Aegean Sea. The story goes that Aegeus, anxiously looking out from Sounion, despaired when he saw a black sail on his son Theseus’s ship, returning from Crete. This led him to believe that his son had been killed in his contest with the dreaded Minotaur, a monster that was half man and half bull. The Minotaur was confined by its owner, King Minos of Crete, in a specially designed labyrinth. Every year, according to the myth, the Athenians were forced to send seven men and seven women to Minos as tribute. These youths were placed in the labyrinth to be devoured by the Minotaur. Theseus had volunteered to go with the third tribute and attempt to slay the beast. He had agreed with his father that if he survived the contest, he would hoist a white sail on his return. In fact, Theseus had successfully overcome and slain the Minotaur, but tragically had simply forgotten about the white sail. 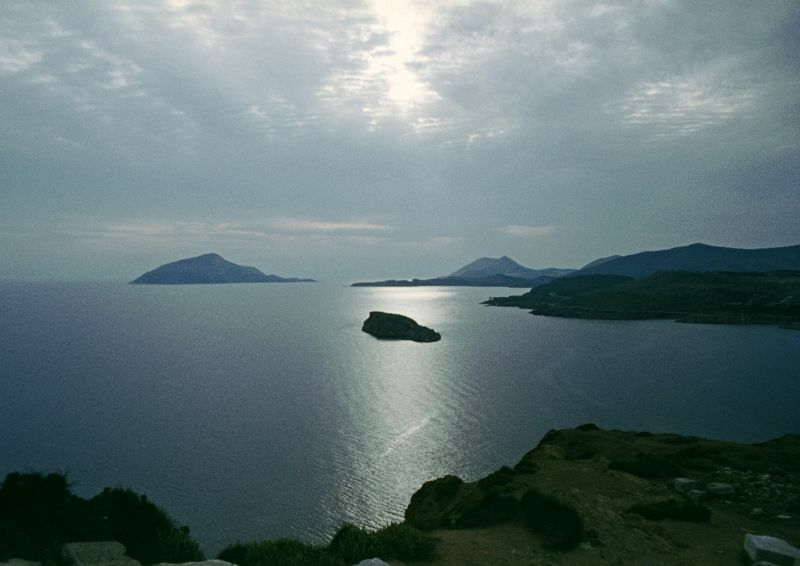 The earliest literary reference to Sounion is in Homer’s poem the Odyssey, probably composed in the 8th century BC. This recounts the mythical tribulations suffered by Greek hero Odysseus in a gruelling 10-year sea-voyage to return to his native island, Ithaca, in the Ionian sea, from the sack of Troy. 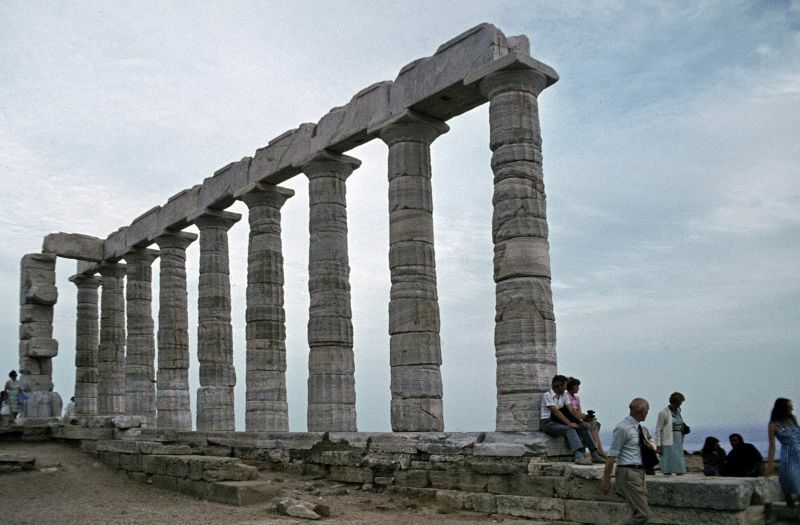 This ordeal was supposedly inflicted upon him by Poseidon, to whom the temple at Sounion was dedicated. 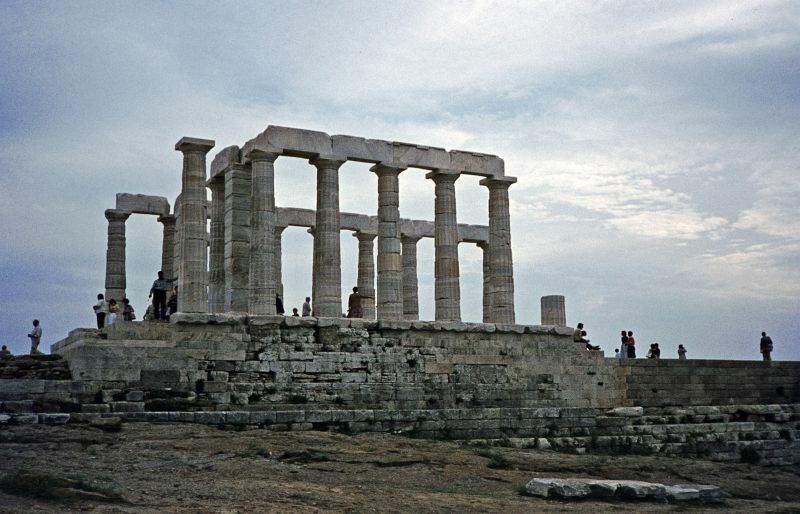 We are told that, as the various Greek commanders sailed back from Troy, the helmsman of the ship of King Menelaus of Sparta died at his post while rounding “holy Sounion, cape of Athens”. 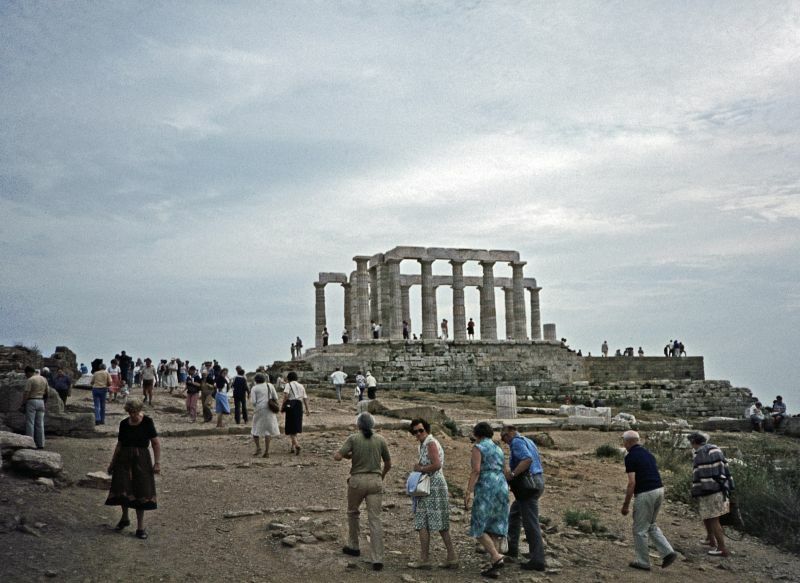 Menelaus landed at Sounion to give his companion full funeral honours (i.e., cremation on a funeral pyre on the beach). The Greek ships were then caught by a storm off Cape Malea and scattered in all directions.